A couple of months ago I had the good fortune to review the second volume in this Ambitus series of Paganini�s chamber works including the guitar (see review). Now the German label has provided the first volume recorded back in 1998. As well as composing scores for the violin Paganini wrote a very substantial body of guitar compositions. A quick check on the �New Grove Online� reveals that he wrote over three hundred scores, a majority of which feature the guitar as solo instrument or include a guitar part. Of the five opus numbers published during his lifetime only the Op. 1 set of 24 Caprices for Solo Violin did not include the guitar. My available sources are rather vague on the origins and dates of Paganini�s attraction to the guitar. I understand however that his main influence was his father Antonio who was himself a mandolin player. It is likely that from an early age the young Paganini would have received instruction from him. Evidently, from around 1801, during the few years that Paganini lived with a wealthy lady on her country estate in Tuscany, his energies were principally channelled into guitar study and composition. The Offenburger String Trio takes their name from the city of Offenburg in Germany which is the trio�s home town where it was founded in 1981. In this case the brothers Frank and Rolf Schilli and Martin Merker are augmented by the services of renowned guitarist Siegbert Remberger. My opinion has not changed from that expressed in my review of volume 2: these Paganini scores are full of surprises both in terms of layout, employment of instrumentation and musical content. I was fascinated how sometimes Paganini�s writing displays a certain vulgarity and the next minute I could be enchanted by his charm and warmth. I often found it difficult to forecast what Paganini would do next and this unpredictability is highly appealing. In the Trio Concertante I was struck by how violist Rolf Schilli and cellist Martin Merker play predominantly in overlapping sections of their ranges. In the attractive first movement Allegro, employing a moderate tempo, the viola and cello dominate the proceedings at 1:57-2:15 and 2:16-2:33 with the guitar providing accompaniment. There are several episodes featuring the guitar most notably at 2:39-3:24. The return of the main theme on the viola and cello at 6:47-7.02 which is repeated at 7:03-7:19 is especially enchanting. The complex and vivacious interplay at 7.20-7:50 heralds the conclusion of the movement. In the carefree and expertly performed Minuetto, Allegro vivo con trio the guitar is liberated, dominating the opening with a motif repeated eight times between 0:17-1:24. First the viola and then the cello at 1:25-2-56 and 2:58-3:29 make a significant contribution. The return of the guitar from 3:53-4:33 closes the movement in very much the same way that it opened. The intimate and haunting main theme of the Adagio, Cantabile is lovingly performed, initially by the viola from 0.00-0:28 followed by the cello at 0:29-1:00. In the sunny and enchanting closing movement Valtz a Rondo, Allegro con energia con trio all three instruments take their turn to display the dance-like qualities of the music. I found the extensive and extrovert viola part especially rich while the cello is performing in its lower range. The guitar part at 3:54-5:21 is magnificently done. The score closing with considerable energy and high drama left me exhausted. The Cantabile for violin and guitar was composed around 1822-24 and is one of many such miniature scores that gained Paganini astonishing audience popularity. Schilli and Remberger perform this sunny and highly attractive short work with great affection. The final work is the Quartet No. 7. I was immediately struck by the expertly crafted mercurial changes of tempo and mood. In the opening lyrical Allegro moderato movement the players communicate genuine enthusiasm and passionListen, for example, to the viola-led section at 4:19-4:59 reminiscent of a bel canto aria from an opera. At 5:35-6:10 the high degree of difficulty of the writing is evident presenting the players with a stern examination that they pass with flying colours. The quartet impresses in Paganini�s wide variety of nuance and colour in the joyous and imaginative Minuetto, Allegretto movement, dominated by extended pizzicato episodes at 0:00-0:55; 2:02-2:30; 4:16-4:43 and 5:40-6:08. The guitar takes centre-stage at 4:43-5:40 with a glorious solo part accompanied by fluent accompaniment from the string trio. With the Adagio cantabile sostenuto con passione Paganini takes the listener into more serious territory with writing of a more intimate quality that predominantly emphasises the middle to higher registers of Schilli�s violin. Here the quartet perform with spirit and considerable lyrical fluency. In the concluding movement Rondo, Vivace, again accentuating the upper range of the violin, the players are in an ebullient mood providing a performance that is long on vivacity and commitment. I was impressed with the fresh, immediate and well balanced recorded sound from the Ambitus engineers, that contains just a hint of sharpness in the forte passages. The booklet notes are interesting and reasonably informative, but left me wanting to know more about these scores. 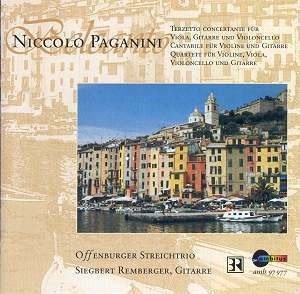 The front cover has an attractive photograph of what seems to be Genoa, Paganini�s birthplace. The second volume contains the first and the last of the fifteen Quartets that Paganini wrote for the combination of violin, viola, cello and guitar, together with a Trio in D major for guitar, violin and cello that were recorded in 2001, in Sch�ttbau, R�gheimon on Ambitus AMB 96 899. I am not familiar with the set but there are more of Paganini�s chamber scores on a five disc collection of the complete Guitar Quartets from the Paganini Quartet on Dynamic DYN 159/1-5. For those wishing to further explore chamber repertoire with guitar there is an excellent recording of Boccherini�s six Guitar Quintets, G 445-450 performed by the Dimov String Quartet and guitarist Jean-Pierre Jumez on Capriccio 49472 (Quintets 1-3) and 49473 (Quintets 4-6). I have the recordings as part of a 10 disc box set on Capriccio 49436. There are hidden gems to be unearthed in these Paganini chamber scores. The Offenburgers and Remberger perform these rewarding and appealing works with impressive vitality and remarkable expression. This is a recording to cherish.